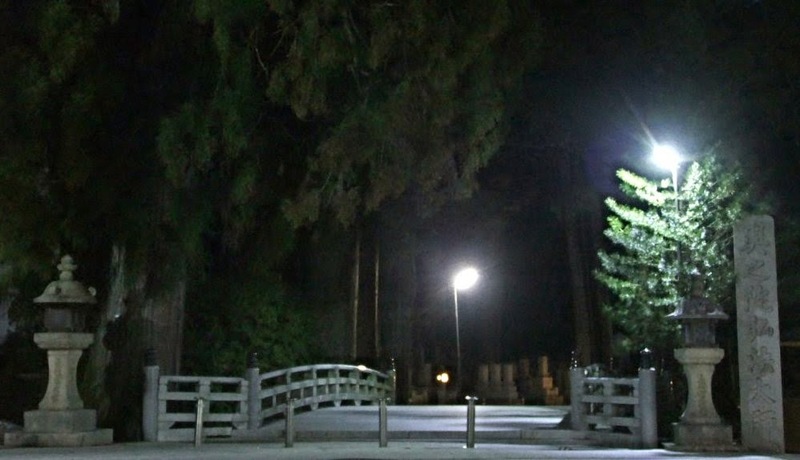 Ichi-no Hashi (lit first bridge) to the Okuno-in cemetery. Koyasan is a Buddhist mountain retreat about 100 km south of Osaka. 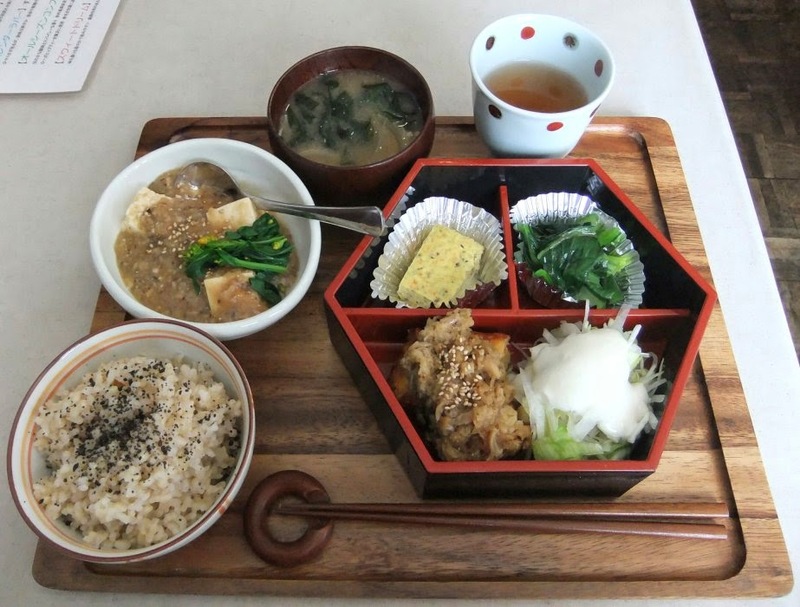 A pilgrimage site for over a thousand years, Koyasan is the best place to experience a taste of life at a Japanese Buddhist temple, including sampling the all-vegan Shojin Ryori (Japanese Buddhist Cuisine). 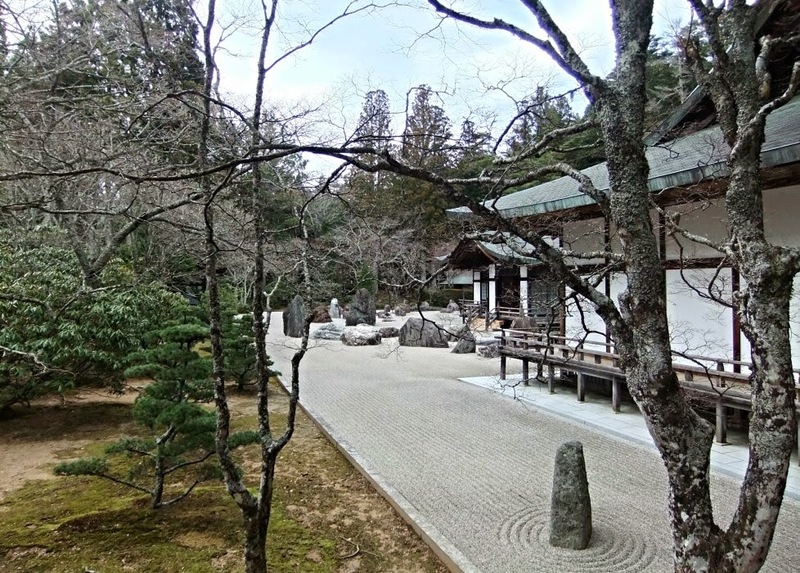 Koyasan is home to Kongonui-ji, the administrative centre of the Shingon Esoteric Buddhist sect, which was founded by Kukei (known posthumously as Kobo Daishi) in 819. The temple appears similar in size and style to major temples in Kyoto, but has a particularly impressive stone garden, probably the most beautiful I've ever seen. 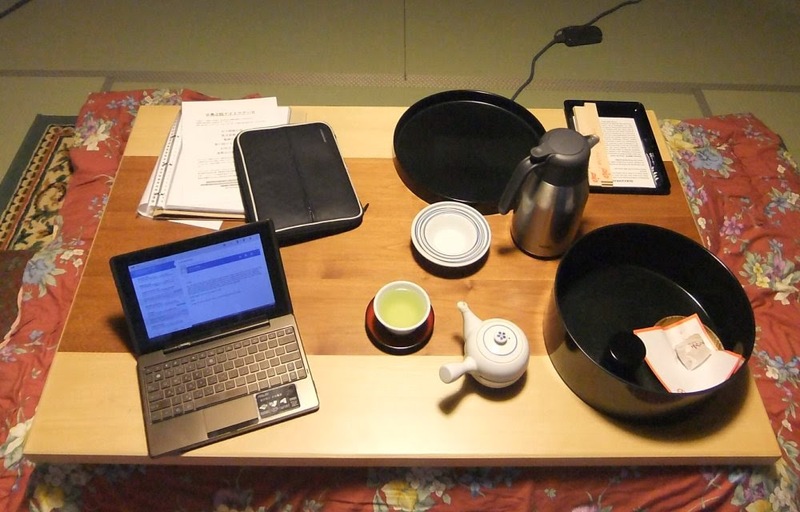 The 500 Yen entrance fee includes a cup of tea and a rice cracker, which, while rather insipid, were vegan (March 2014). As well as a very influential Buddhist Master and founder of the Shingon sect, Kukei was also a scholar, poet, calligrapher and civil servant, and he is perhaps most famous for inventing Kana, Japan's two phoenetic alphabets (which, together with Kanji, or Chinese characters, make up the Japanese writing system). A popular legend is that Kukei is still meditating in his tomb, waiting for the liberation of all souls. Kukei learned much of his Buddhist teachings on a pilgrimage to Chang-an (present-day Xian), then the capital of the Tang Dynasty, from 804 to 806. During this period (as difficult as it may be to believe today) Japan revered China, and as a result both Kanji and Buddhism were 'imported' to Japan. Many Kanji (Chinese characters) have two pronunciations, with one being the original Japanese one and the other being a variant on the Chinese pronunciation. The Chinese ones are more commonly used for long words, but there are no strict rules. For example the 'san' of 'Fujisan' is a variant of the Chinese 'Shan' (mountain), whereas the traditional Japanese word for mountain is 'Yama'. Buddhism and Shintoism (the native animistic religion of Japan) didn't fit so well together at first, however they now enjoy a harmonious relationship with Shintoism dealing with matters of life (eg weddings, new year blessings) and Buddhism matters of death, such as funerals. Most Japanese consider themselves both Buddhist and Shintoist. 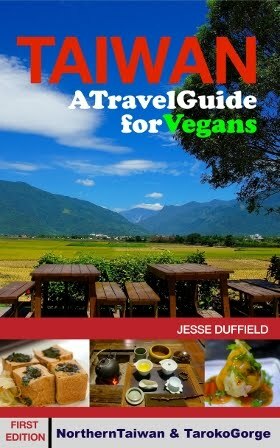 Of particular interest to vegans, however, is that Chinese Buddhism (including that practised in Korea, Taiwan and other countries) strictly prohibits the eating of animals, and from my limited knowledge of Buddhism (especially Japanese Buddhism) Kobo Daishi appears to have kept this important Buddhist tenet of Ahimsa (non-violence) much better than other Japanese sects, presumably as a result of his study and connections with Chinese Buddhist Masters. 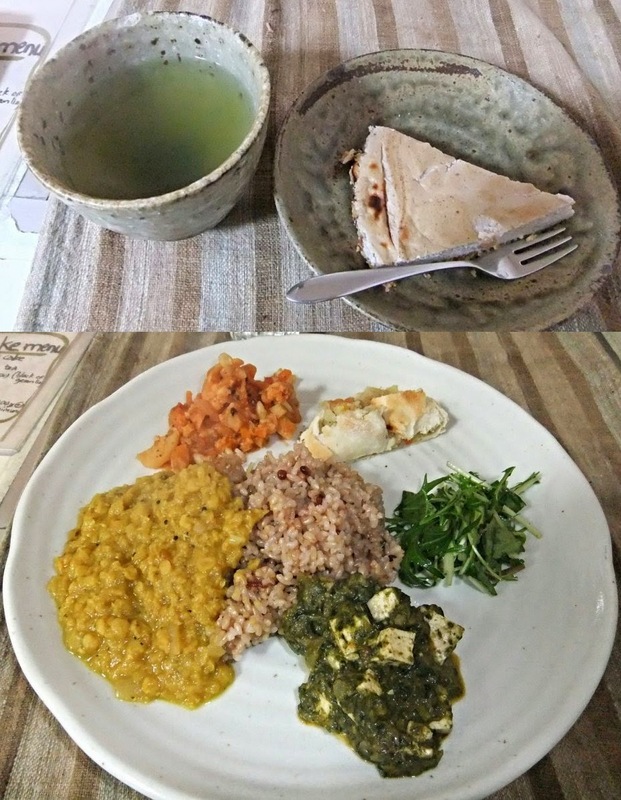 The Koyasan temples which invite guests for shukubo (pilgrimage lodging) serve strictly vegan food (almost, see below), and, like in Taiwan, the food also does not contain onion or garlic. I stayed at Eko-in because I was recommended it by a colleague, and would recommend it to anyone else, however there are plenty of other temples offering lodgings. Eko-in has particularly young monks who speak good English. Shojin-ryori (Buddhist temple cuisine) dinner at Eko-in. The dinner was a typical, delicious shojin ryori meal, with a perfect balance of colours, tastes and textures, with breakfast being a simpler but still very satisfying meal. I opted for the simplest meal set, which (with accommodation) cost 10 000 Yen, an excellent deal given that this meal itself elsewhere would easily be at least half that. There are more elaborate options available, and with vegan food being so hard to find - and shojin ryori so expensive - it was tempting to splurge, but I personally find something a little unsettling about coming to a Buddhist pilgrimage site to gouge myself with food, however difficult it is to find elsewhere. The simplest meal was more than sufficient for my large appetite, but I'm sure the larger meals are extraordinary. 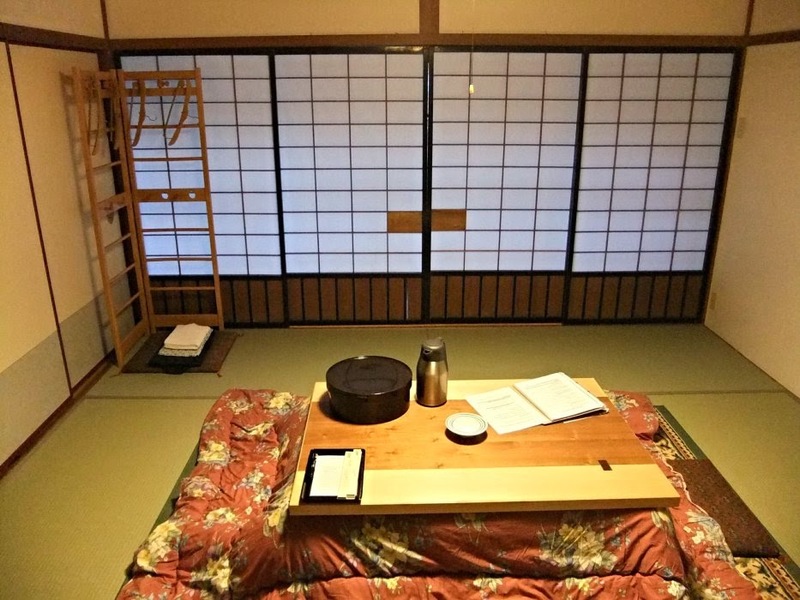 There are cheaper lodgings available at other temples and guesthouses, and many temples offer shojin ryori to guests not staying with them. 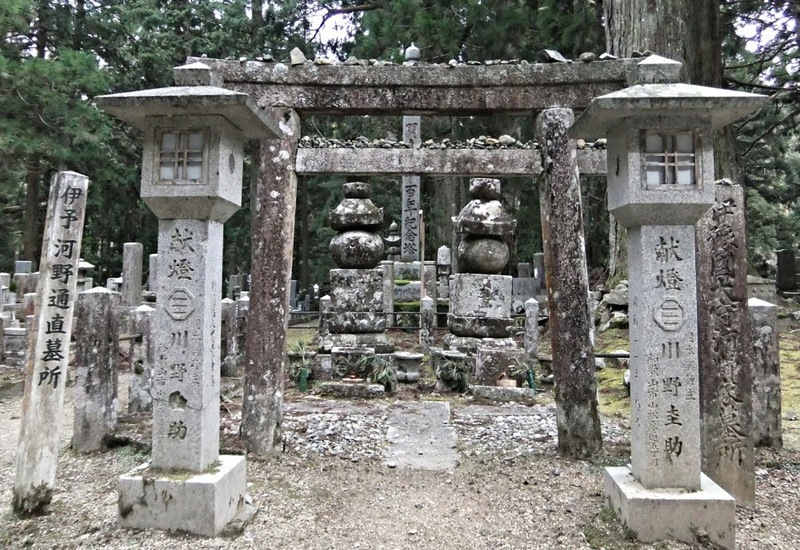 The key attraction is Okuno-in, a cemetery containing over 200 000 burial sites, dating back over a thousand years. 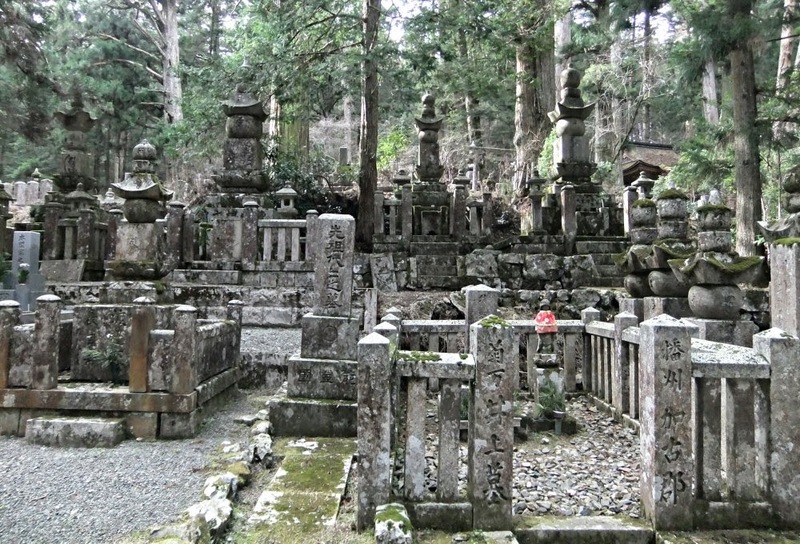 The cemetery is surrounded by Japanese Cedars, which give it a peaceful but sometimes eerie feel. The trees are an average of 200 - 600 years old, but some are over a thousand years old. They are chopped down (I wonder how) when they become at risk of falling over during typhoons. There are some strange monuments, including one for victims of world War II who died in Malaysia (of all nationalities), and apparently one (which I couldn't find) from a termite control company for the souls of its white ant victims. 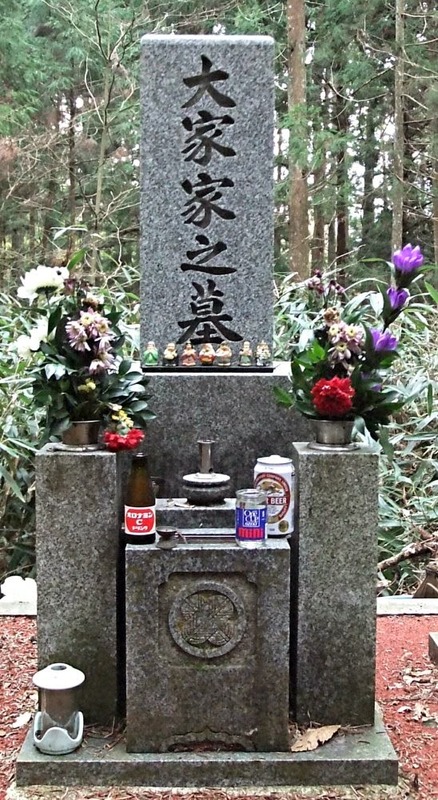 Not so traditional offerings to the dead: beer, sake and an energy drink. 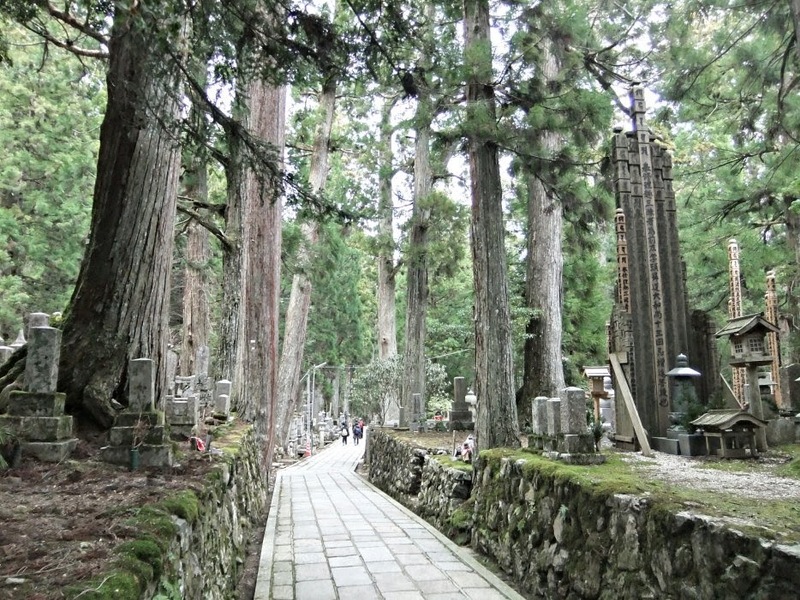 The cemetery is divided into sections separated by three bridges, and at the end is the tomb of Kobo Daishi himself. It's important to remember that this is a sacred site, and visitors are asked not to take photographs beyond the third bridge (including Kobo Daishi's tomb and its associated temple). These mausoleums for Daimyo (territorial lord) Matsudaira Hideyasu and his mother are about 400 years old, and are made entirely of stone. I took the highly-informative evening tour (provided by a young monk from Eko-in who studied English in the UK, who was clearly passionate about Buddhism) and highly recommend it. It's aimed at foreign tourists with no background in Buddhism, so anyone who has studied Buddhism before probably won't learn a lot more, but the information about the cemetery and the history of Koyasan still makes it well worth the 1500 Yen. It's also available to people not staying at Eko-in. 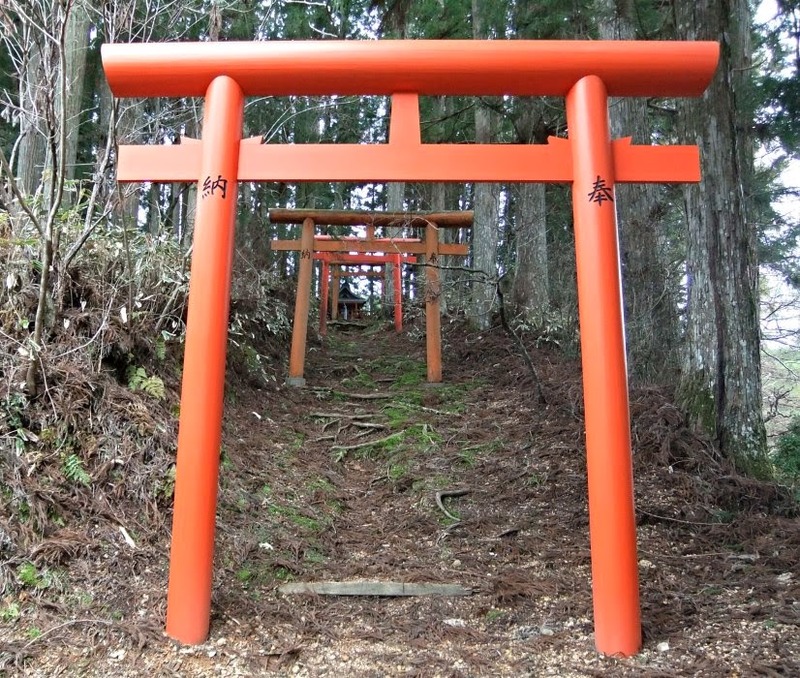 The torii (gate) shown here is always used at the entrance of a Shinto shrine, but not at Buddhist temples. 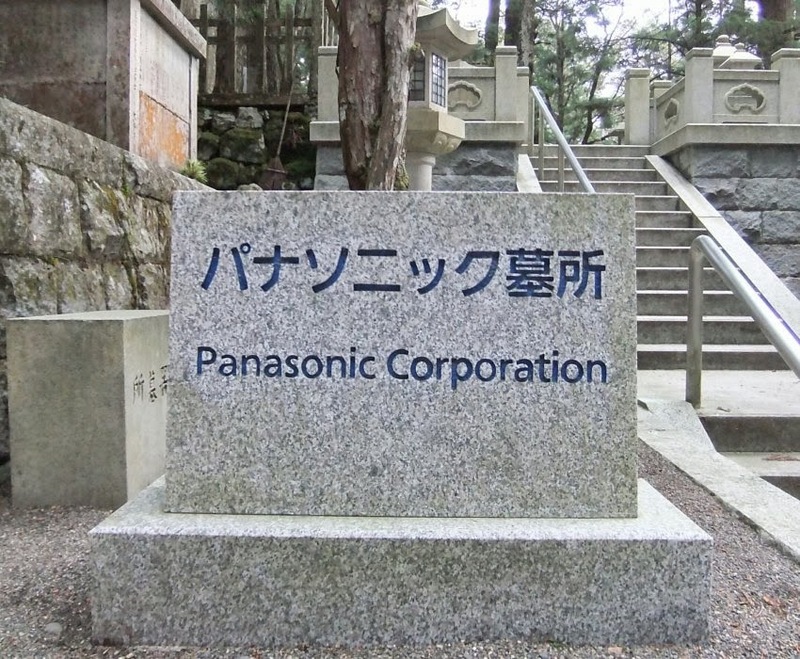 Their presence in this Buddhist graveyard reflects how most Japanese have, for centuries, considered themselves both Buddhist and Shintoist. 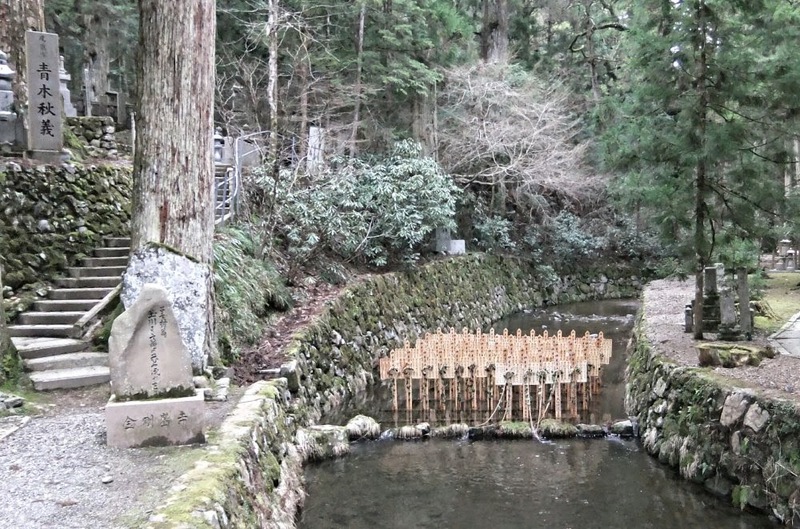 These wooden monuments, in stream close to the third bridge, are to "water babies", which are either miscarried or aborted. I couldn't help but feeling, especially at first, that Koyasan is now so commercialised that it's lost a little of the charm it must have had for most of its thousand plus-year history. 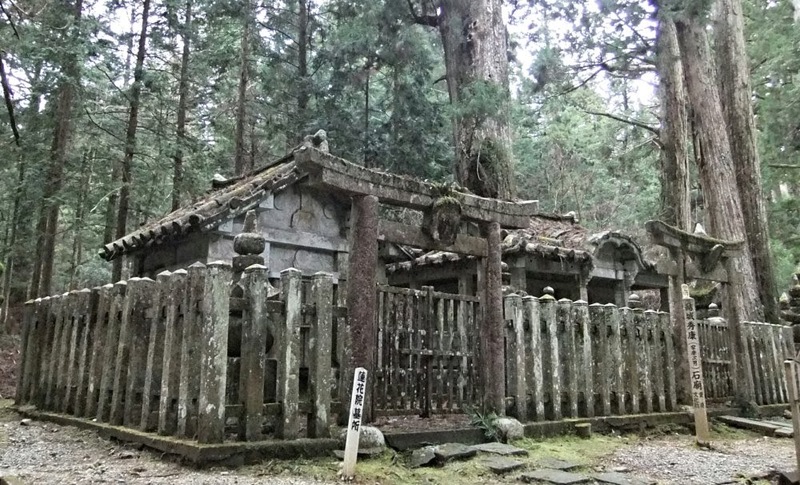 Clearly shukubo (temple lodging) is big business, and the one might perhaps feel that the Shingo Sect is cashing in, and this article discusses how the temples have lost millions in investments with the declining value of the yen. During the morning chanting session there were about 40 guests, of which I counted four not Caucasian, two of whom were North Asian and another two East Asian, possibly Korean; I don't think there were any Japanese in the audience. However, it is a bona fide temple, and the rituals are authentic (so must be respected as such) and it's just a sign of the times that so many tourists (mostly foreigners) want to come to Koyasan, so it's expanding and developing to keep up with the times, Japan style. Despite a huge foreign audience taking photos (flashes not allowed) these morning rituals seemed very authentic. Like climbing Mt Fuji, this long-time pilgrimage is now a tourist event, and disappointing as that is, it also brings its own conveniences: I woke up in Yokohama, had lunch at my favourite restaurant in Osaka (Genmai Harmony) and was at Koyasan before dusk. Just don't expect to have to climb a mountain or beg for alms along the way: every self-respecting 21st century pilgrim needs luxurious public transport, wireless internet and flat screen TVs in their lodging. 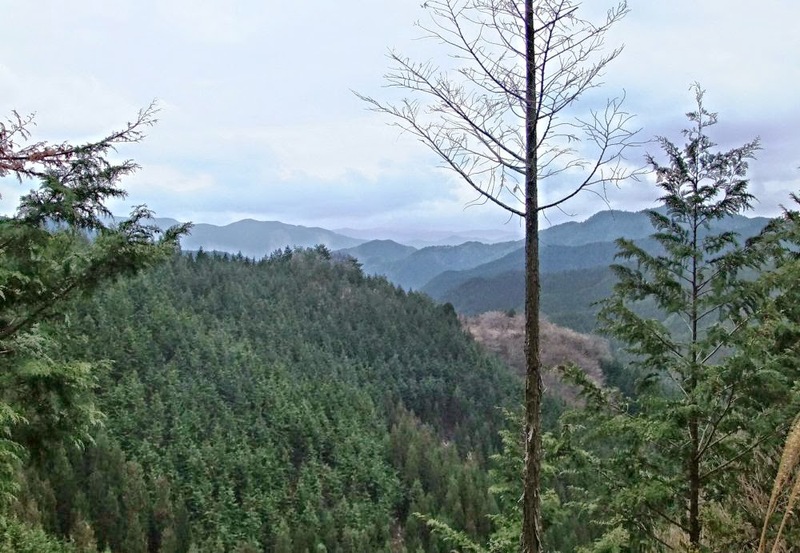 That said, the pilgrimage route up the mountain is still a beautiful hike, which I hope to do at some point in future. Take plenty of food and drink, as there's little available along the way, and be prepared for the weather to drop and the temperature to change suddenly. 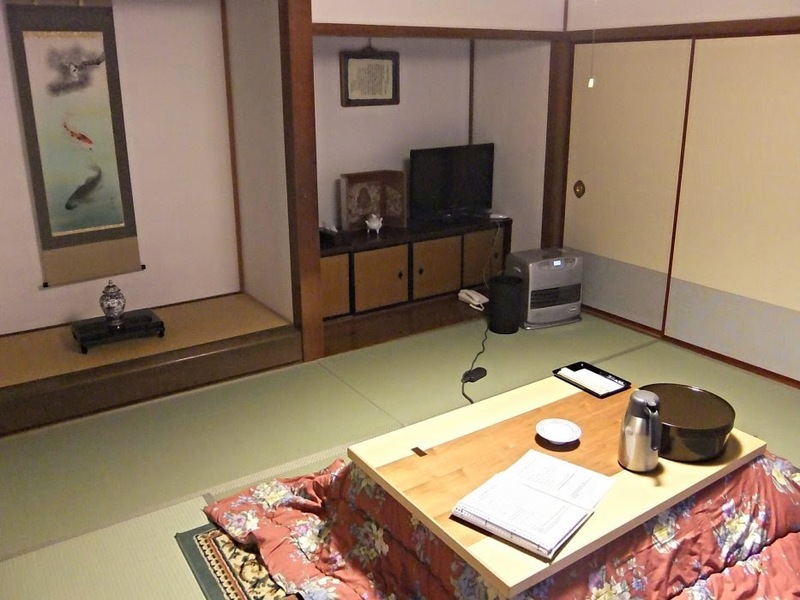 A flat-screen TV is essential to any Buddhist mountain-retreat (same room as shown above). One disappointment, and a warning, is that the cake in the rooms (with the tea) contains egg. One can never be too careful in Japan, but this was disappointing for a Buddhist temple! Disappointing: this complimentary cake at Eko-in contains egg. For lunch I went to Bon An Sha International Cafe, a charming little establishment run by a French woman and her Japanese husband. The lunch set could easily be made vegan, including a tofu cheesecake, and it was very reasonably priced. According to Happycow there is also San Bon, but when I visited they had sold out by early afternoon. I went for a walk into the mountains behind the main town. There was nothing spectacular about the views, but the scenery was still very beautiful, and I always enjoy breathing the mountain air. And it's always nice to stumble on small shrines and temples. Like in Kyoto, I often enjoy visiting these serene, deserted sites more than the big-ticket temples. Getting to Koyasan (the easy way) is an experience in itself. 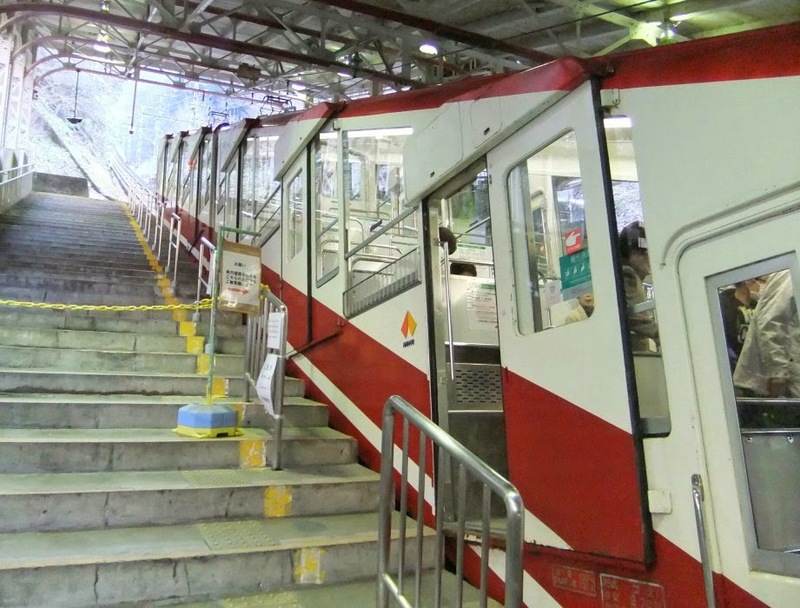 The easiest way is to take the a Nankai train from Namba(Nankai) station to Hashimoto, and take the spectacular cable car up the mountain. It's well worth buying a Koyasan Discount Ticket, which includes round-trip train tickets, bus travel at Koyasan and discounts to some attractions. 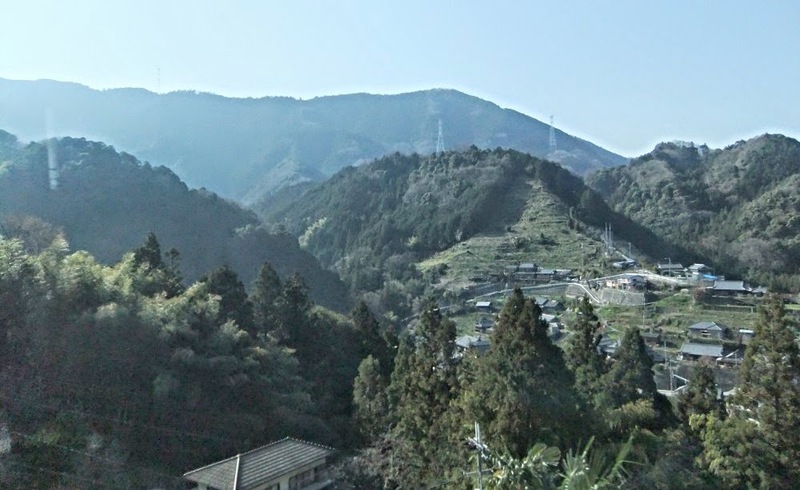 The train ride to Koyasan passes through some beautiful mountain scenery. Note that the more expensive 'Limited Express' ticket only entitles one to a limited express on the way TO Koyasan; to ride a limited express on the way back is another 500 Yen (nothing to worry about, but I thought it was a bit strange). The whole journey by limited express takes about 1.5 hours by limited express trains, and two hours by normal (express) trains. It's a very enjoyable ride. If you go to Osaka by shinkansen, I highly recommend a visit to Genmai Harmony, which is on the way from Shin-Osaka. lunch at Genmai Harmony, near Shin-Osaka Station. Overall I would highly recommend a trip to Koyasan to anyone spending a few days in Kansai. I would make at least two days (preferably three or more) in Kyoto a higher priority, but I would put Koyasan ahead of Osaka. I aim to write up Kyoto in the near future, but for the meantime I recommend spending hours and hours just walking and finding your own beautiful, sacred spots, and eating at Morpho Cafe and Vegans Cafe and Restaurant (upmarket) and for simpler but still amazingly delicious meals at Veggie Cafe and Sujata. 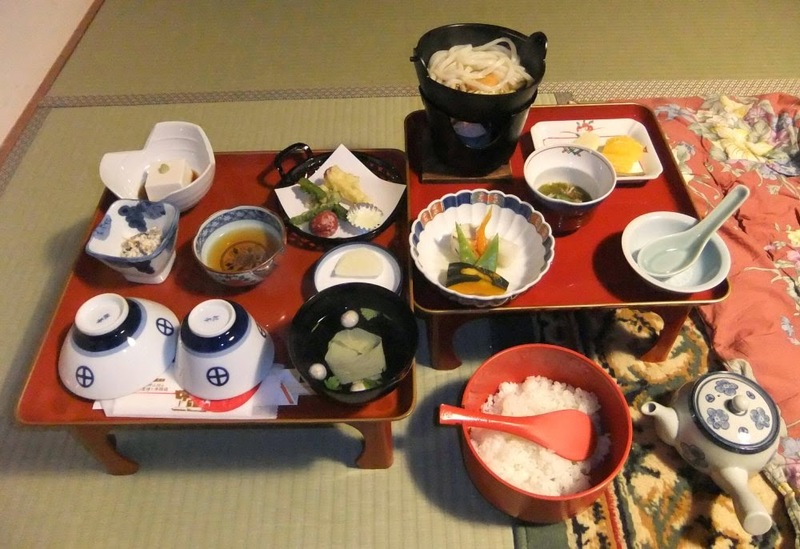 I stayed at Koyasan in 2014, and similar to your experience, the complementary "cakes" had eggs in them. Moreover, one night one of the sweets in the temple's shojin ryori (we were at Ichijoin) obviously used milk. We asked about it by talking to the monk intern who served the food. He explained that drinking milk didn't involve killing a life, and therefore was considered OK to have it in the food. I was totally surprised by dairy creeping into traditional temple food. Thanks for the info - it's good for readers to know that. 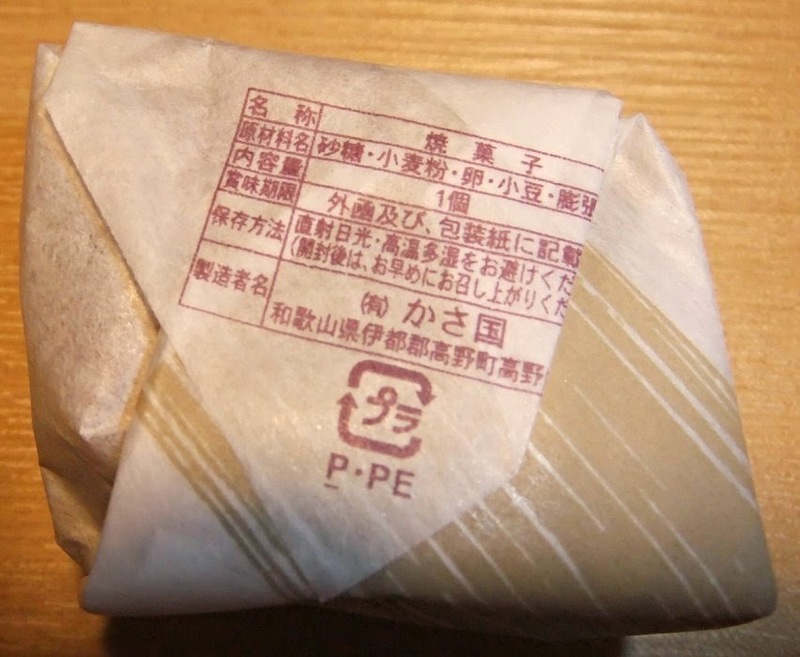 Unfortuantely it seems to be increasingly common all over Japan for shojin ryori to contain dairy products. It's so sad when this traditional Buddhist food is so delicious, so I can't see why anyone would want to add dairy!